Q: How do cats purr? A: For many years, scientists couldn’t figure out what made noise when cats purred. 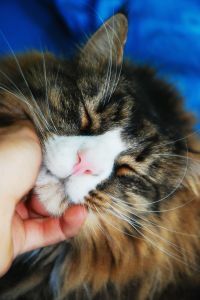 Fairly recently, scientists discovered that the purring sound is made when a blood vessel in the cat’s throat vibrates. Actually, studies have shown that the frequency of cats purring may actually increase your bone density. Online, you can buy Cat Purring CDs to get this effect.